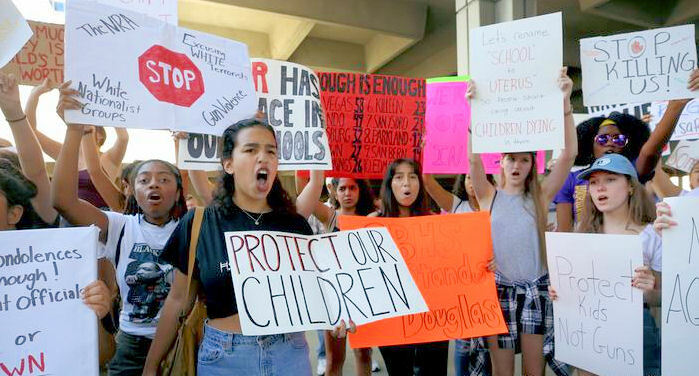 On February 14, 2018 as most Americans were celebrating and preparing romantic gestures, sharing sentiments expressing love on our annual Valentines Day, a sinister and cowardly act of Mass Gun Violence was carried out at Marjory Stoneman Douglas High School located in Parkland, Florida. A total of 17 people were killed as the teen gunman, sprayed bullets from a high-powered military assault rifle. Imagine the mindset of those students, who undoubtedly were doing what teenagers should be doing at this special time in their lives -celebrating Valentines Day with each other. Imagine how many times the words “I Love You’” were shared prior to the horrific actions by a lone 19 year old expelled former student, named Nikolas Cruz. Balloons, cards, flowers, and artwork expressing love were all around. Suddenly. In an instant, evil reared its ugly head and now blood, screams, fear, and horror filled the hallways. Now people were huddled and were carrying out the training protocols that unfortunately have to be taught in schools across America today because it has eerily become normal. Most people of a certain age just had normal fire evacuation drills. In today’s society a new set of drills and emergency preparation has to take place -and “a shooter with a riffle” is normal training. Think about that. Sadness, anger, and the pain of losing loved ones are always the residual feelings that family and friends feel after the sheer shock that happens after mass shootings. The playbook comes out. We all know the routine, politicians make cookie cutter statements like “our hearts and prayers go out to the families and friends of those who lost loved ones”. And of course, depending on the shooter’s race, we know how the story will be spun. In this case (as it has been with most of these so-called random acts), the shooter is a young Caucasian American who owned lots of riffles. Per the normal playbook, he must have been neglected and suffers from too many traumatic events, which have driven his mind mad, mental health issue, blah blah blah. Yes, that whole narrative. Fine. If, we are to allow room for such thinking, then certainly and without doubt, plenty of resources and support for Gun Violence Prevention Organizations like WAG is more important than ever. WAG is doing the work of ensuring that young people are mentally healthy by guiding them. WAG is giving valuable Conflict Resolution skills to an underserved community. Our efforts, and programs empower those who feel pain and need direction. We save lives. We will continue more on this particular story but for now, we must pay respect the families who are still burying loved ones as this post is being written. We ask that you please read their names and realize how important your donations and support for WAG is. Please click the donate button and pledge your support to help sponsor an anti-violence workshop. Your contribution can help save an at-risk child’s life. I think that gun violence should be stopped. Or somebody has to tell Donald Trump, or else there will never come an end to it! Firstly, please let me applaud your unwavering bravery. This is the first time I feel optimistic about changes in gun laws. In addition to your protests, I’m ecstatic that some of you will soon vote. Secondly, I request that you please address school bullying as part of your comprehensive approach in eliminating gun violence? While I don’t believe mass shooters should be absolved of their actions, I believe that addressing this issue is one more facet in preventing such senseless violence. The wise student that suggested just asking an obviously disturbed classmate something to the affect of ‘Are you having a bad day?’ was on the right track. She worded this more artfully but I believe you see my point. Too often there’s a blind eye taken towards bullying. We need acts of kindness in our increasingly callous culture. Again, in addition to gun lobbying, could you please add anti-bullying as another prong in your approach? If there’s a more appropriate ‘never again’ email for the concerns just submitted, could you please provide it. This would be very much appreciated. I don’t know if you are intentionally misleading with your comments or if you are just stupid. The shooter used an AR-15, a semi-automatic rifle which fires one bullet per trigger pull; there was no (automatic) “spraying” of bullets. In addition, an AR-15 is not a military-grade rifle. I say this as a former infantryman who carried an M16A1 and M16A2 while serving my country overseas. As to the term ‘assault rifle’, that is a media made up term that no military person would use to describe their firearms. And as to the second amendment, that right is more important to me than the lives of those kids or anyone for that matter. You will never change my mind. I am willing to fight and die to preserve my rights; are you willing to kill me to deny them? I am a trained lawyer working on reinstatement to The Md. Bar. I am of mature years. I think I can help in the fight against gun violence. I desire the chance to discuss the possibilities with you. Would love to. 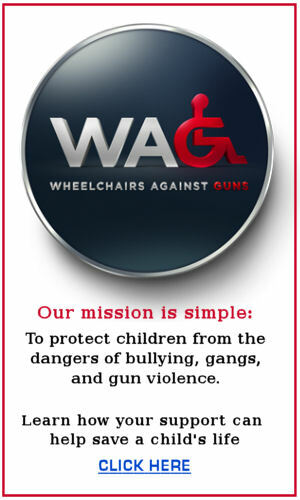 Can you email us at wheelchairsagainstgunsnyc@gmail.com. Thanks looking forward to speaking with you on the very important topic.